Using two simple wooden sticks can be such a wonderful source of learning and entertainment for toddlers and preschoolers. Getting them to clap or directly work with their bodies is one new thing they are learning to do, but adding an external object is a little tougher. This takes more coordination on their part. Young children are very quickly gaining hand eye coordination skills through video games and electronic media, but the act of using wooden dowels makes it physical. Little boys love being able to bang sticks, but so do girls. Here are some of the activities that I use. 2. Froggy in the Meadow This is a little rhyme that I learned and use almost every week with my toddlers. “Froggy in the meadow, can’t get him out. Take your sticks and try to get him out!” Then the children and I bang our sticks very quickly and loudly on the floor. This is wonderful because these young children are mirroring me. It is so very important that these children learn to follow what I am doing. We then chant together, “Froggy in the meadow, can’t get him out. Take your sticks and stir him about.” Then the children and I take our sticks and stir them on the floor together. We then chant the first part because nothing has yet worked to get that froggy out. The last time we chant and then bang our sticks we can say, “Yay, we got him out.” I then say “Sticks up” to get ready for the next activity. Putting our sticks up is a great way to transition from one activity to the next as it will help keep them from being distracted. 3. Do As I’m Doing This is something I sing, but it could also be chanted rhythmically. “Do as I’m doing, follow, follow me. Do as I’m doing, follow, follow me.” I tap sticks on the floor counting to four so that the children can hear that four beat count. I then change my action and click the sticks together, repeating this same song or chant. I can make up as many actions for them to follow as I choose. Here is where the teacher can get creative and use what works best for the children. Again, this is an excellent mirroring and following directions activity. The children have to watch me to know how to do the activities. This is also another good activity to musically let them feel rhythm. 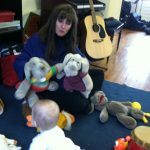 It takes toddlers a while to fully grasp rhythm, but believe me, if I do rhythm activities consistently, they will learn to feel and understand rhythm. I say that there will be no learning of music without understanding rhythm. This is very important and a necessary foundation. I have seen success as they grow older. The key is knowing what they grasp and expecting no more. This is teaching for success and success is measured in very small things. Appreciate every tidbit of success! 4. The Cobbler Song This is the chant that I use, but different poems or chants could be used. I have the children take one stick and hold it up vertically while the bottom of the stick rests on the floor. Then they take their second stick and hammer the top of that stick. I always tell them that they are hammering a nail. (Good sticks that are not too long or narrow are best for this activity, and sticks that have flat ends are best.) Here is how my rhyme goes. “There’s a cobber down the street, Mending shoes for little feet, With a bang and a bang and a bang, bang, bang, With a bang and a bang and a bang, bang, bang. Mending shoes all day long, Mending shoes to make them strong, With a bang, and a bang, and a bang, bang, bang, With a bang and a bang, and a bang, bang, bang.” Any rhyme that allows them to hammer could be used. Again, this is another great mirroring, following, and rhythm activity. 5. Five Little Monkeys This is a great little break after I have worked them hard as they have had to to follow me. I simply have them hold their five fingers up (Toddlers can try to help me count them but will not understand the eliminating one finger at a time process.) I simply have them bang a stick on the ground each time that monkey bumps his head (and then I add a pause in the rhythm and say, “Ow”) This is just a simple chant that children absolutely love. A little fun mixed in with work. This is what works best with children and children’s programs. Teachers and leaders have to mix up the work with fun, but it always has to be fun to keep children’s attention. 6. 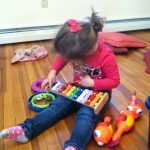 Rhythm Activities with Preschoolers I will not elaborate here as I have discussed this more in my other blogs, but sticks are great for counting beats and rhythms. It is really nice to be able to use an external object besides their hands to teach them more coordinated movement. This is also a great introduction to preparing them to play a real instrument. The simple action of playing the sticks instead of their hands is a step that prepares their brains for learning to play an instrument. With preschoolers, drums would be next, but for starters, sticks are a little less distracting. Sticks are a wonderful. They are but one manipulative among many that can be used. There are many more activities with sticks that have been created. These are only a few examples. Try making sticks one of your toddler or preschool activities.